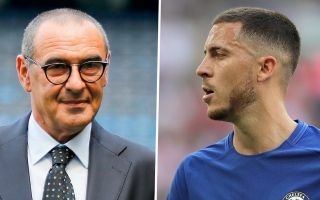 Pundit Martin Keown has heaped praise on the way Chelsea manager Maurizio Sarri has used star player Eden Hazard recently. The former Arsenal defender has discussed the way Sarri has cleverly rested Blues star Hazard in the Europa League before also putting him on the bench against Liverpool last night. It was as a substitute that the Belgium international came on at Anfield to score a stunning solo winner and send Chelsea through to the fourth round of the Carabao Cup. Keown believes Sarri’s use of the player is key to how well the 27-year-old is playing, describing in his question-and-answer session with the Daily Mail that his goal last night was the Italian tactician’s reward. ‘Eden Hazard did not travel to Greece for Chelsea’s Europa League clash with PAOK, then he came back and scored a super goal against Liverpool in the Carabao Cup. Sarri rested his best player and got his reward,’ Keown said. Chelsea fans will be delighted to see their new manager and star player seeming to hit it off so well this season after last term’s difficulties under Antonio Conte. CFC’s style of play now looks far more suited to Hazard’s strengths, and it seems to have majorly boosted his confidence early on this season as he plays some truly stunning football.